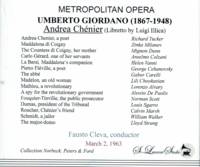 "[In 1963] CHENIER was still very much in Milanov's current repertory. 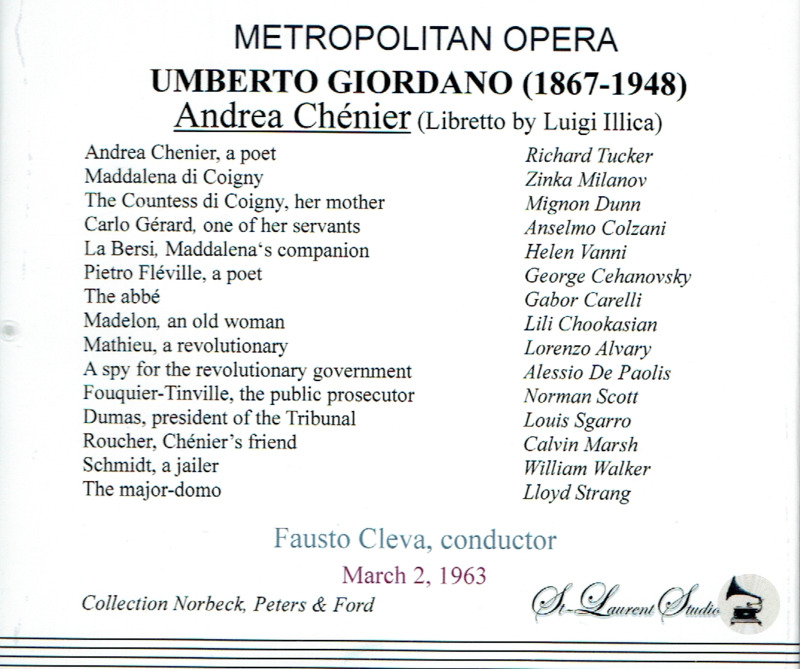 Perhaps there was balm for the soul in her gaining that opera for her final broadcast on 2 March, 1963. The faithful [Milton] Cross expresses 'special pleasure' in dedicating the CHENIER broadcast as an anniversary offering to Milanov, 'this great artist and beloved friend'. Though not planned as a tribute, the performance as a whole is worthy of the soprano. Even when the gloss if off the fabric of her tone, it retains a measure of succulence quite individual and reassuring. Now, when the opulence is diminished but the style remains majestic, the phrasing can sometimes seem a bit ostentatious, since its grand expanse is not filled to the fullest with comparably sumptuous tone. Everything about her performance on this afternoon reveals the diligence of the dedicated artist. We, who are in her debt, can applaud not only her success on this afternoon, but join Cross at her final bow in saluting her forty-seven [Met] broadcasts." 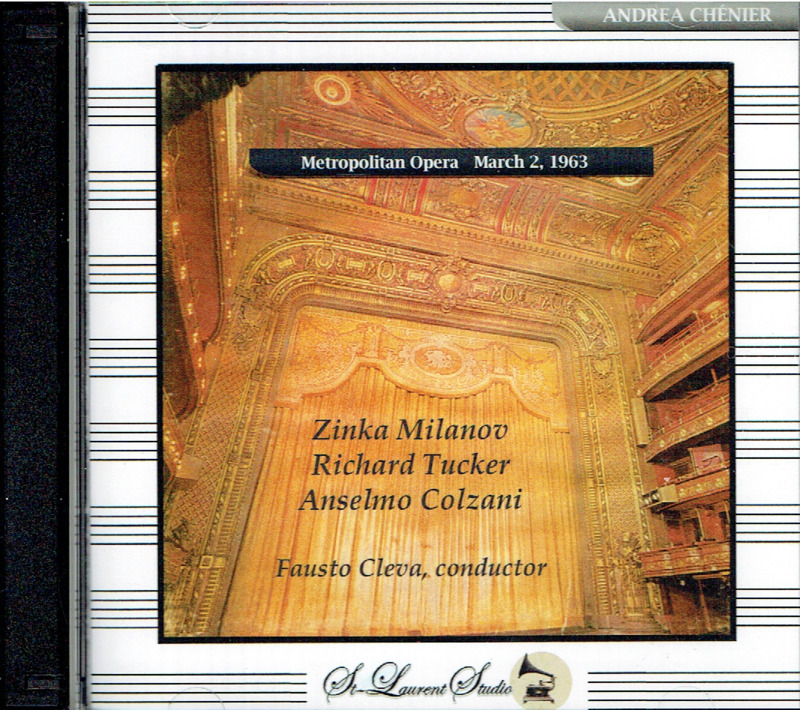 "[Colzani] may never have quite entered the pantheon of great Italian baritones, but Anselmo Colzani was never that far off. He also had to contend with an era in which the likes of Tito Gobbi, Ettore Bastianini and Giuseppe Taddei bestrode the world's opera stages. He was in demand internationally too, making his Metropolitan Opera debut in 1960, where he played Simon Boccanegra. There was a great deal of pressure on the new arrival, as the Met's favourite baritone, Leonard Warren, had died weeks before. If Colzani never became the next Warren, he did become a Met regular. He sang 272 performances there over the next 16 seasons."